The taste of miso soup can vary greatly – some are thin and mild, others have a thick, saltier taste – so it’s really a matter of personal taste. Being the salt lover I am, I like my miso soup salty! Last night, we were craving sushi, so we headed to the closest sushi spot – Godzila (one ‘L’!) Sushi in Lower Pacific Heights. Obviously, no sushi meal can commence without miso soup, so that’s what I had! Salty and delicious, with just a few bits of tofu and seaweed, and a few slices of scallion, this soup was the perfect tastebud tease to prep us for the main course! 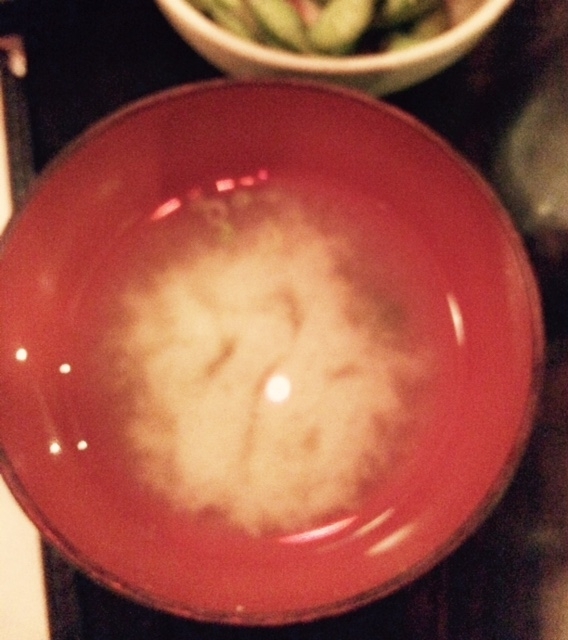 It’s now my favorite miso soup in the city in fact…I can’t wait to go back. And, it’s only $2.50 – sweet! It’s like there’s a ball of sun in the center of this delicious Miso soup! Don’t forget to try the Godzila Roll when you go!